The first day of a junior slam is always filled with excitement, with many young players fulfilling the dream of playing at the sport's top venues. 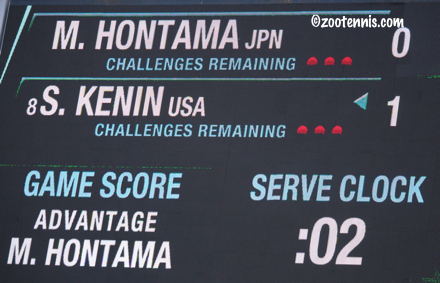 An extra dose of novelty was added today with the introduction of a serve clock, an experiment the USTA is conducting to see if time taken between points can be shortened. As it turned out, its impact was minimal, with most juniors accustomed to playing quickly anyway, and on the rare occasion the serve clock did tick down to zero, nothing happened. With not so much as a soft warning, let alone an official time violation warning from the chair umpire, the serve clock is not the hard-and-fast rule that the shot clock is in basketball or football. 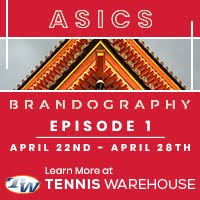 "The chair umpire kind of mentioned that it would be up to him whether he would enforce it or not," said Nicole Mossmer, who beat Laura Escauriza of Paraguay 6-1, 6-3. "I think if we would have kept going over the shot clock time, he definitely would have said something. He made it seem like it was more for us to just be aware of." The chair umpires generally waited until five seconds after the point ended to start the clock, which they do by pushing a button. When the server goes into her motion, they again push the button to deactivate it. This is between the first and second point; there is no clock running before the first point is played. "I think I only looked at it one time," said Brandon Holt, who defeated Ergi Kirkin of Turkey 6-4, 6-2. "And it said like, 17 seconds. I think we were playing really fast points, never got even close. I think at the end, the guy didn't even turn it on." I'll have a more detailed look at the experiment later, after a full week of its use and after more conversations with players about it. The service clock was of secondary concern to both Mossmer and Holt, whose wins were especially noteworthy. 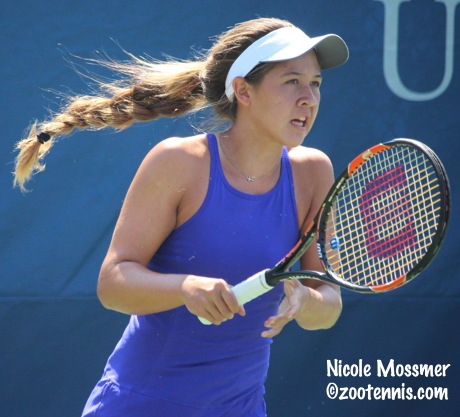 Mossmer, the USTA 16s National Champion, played that division in San Diego expressly for the chance at the wild card into the US Open Juniors the winner receives. "One of the only reasons I played 16s was to get to play the Junior US Open," said the 16-year-old from La Jolla, California. "That's been my goal all year. It's been such a great couple of weeks for me and to get to win here in New York, it's the best one to win your first match at. When I walked on the court, the atmosphere, you hear everyone screaming on Ashe, it's just so amazing. I feel like a pro." Although Holt had the US Open experience last year, reaching the boys doubles final, he suffered a stress fracture in the first rib of his back during the European clay swing and was unable to compete at Wimbledon or Kalamazoo. "The doctors said it was a really abnormal injury to get, unless if it's from lifting weights where there's pressure directly on it," said Holt, who has just been back hitting for about three weeks, mostly with his new teammates at USC. "That's not how I got it, but it may have been playing a lot of tournaments after it's rained on the clay--heavy balls, heavy conditions. You never know exactly, but that may have escalated it." The pain he experienced signaled to Holt that something was wrong. "When I was playing in France (at the French Open) and at the tournament in Belgium, it was really tough to hold the racquet after a point. It was terrible pain. I was taping it, putting cream on it, thinking it was muscular, but it wasn't. On the way home, it hurt to breathe. I had to sleep on my left side, because when I moved, it hurt like crazy." Holt wasn't diagnosed immediately and thought he would be back after a week or two, but later, after a bone scan, the fracture was detected and rest was the only treatment. Getting a win in his first competitive match in months was a bonus for Holt. "I was just really excited to get back on the court," said Holt, who started classes last month at USC. "Just to see how it would go. I have absolutely no pressure really. I think the biggest factor for me was how weird it felt for me mentally on the court. I haven't played a deuce point at 5-4 in three months, I don't know what to do. But I think I did pretty well. I guess I learned you don't lose it very much. I'm pretty excited and stoked about that." 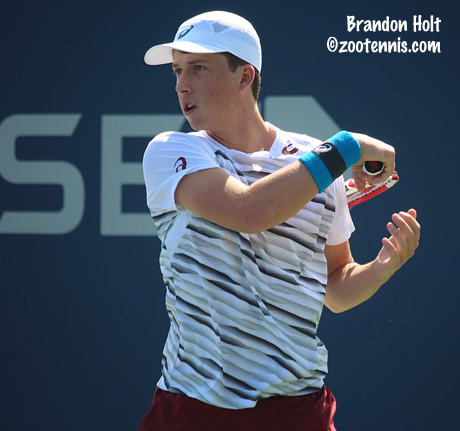 Holt was one of four US boys to advanced to the second round, two of them wild cards, with Alexandre Rotsaert defeating Eduard Guell Bartrina of Spain 6-4, 6-3 and Sebastian Korda beating Ryan Storrie of Great Britain 6-4, 6-4. 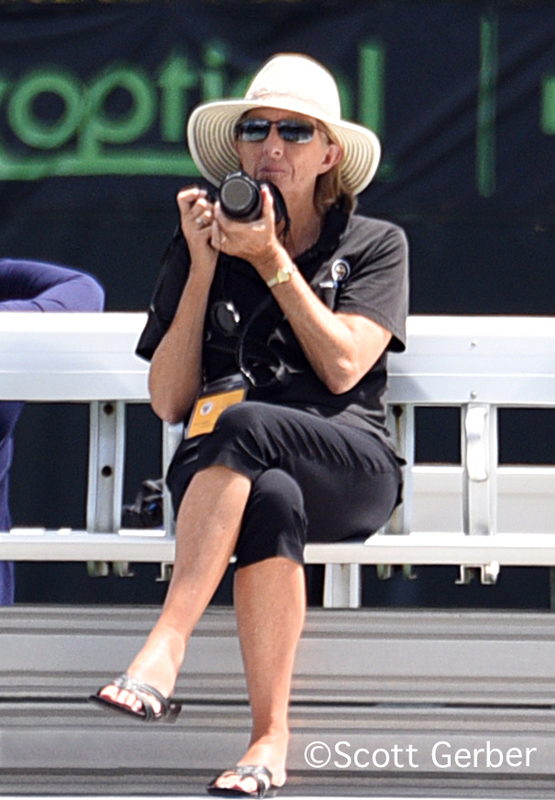 Korda, the son of 1998 Australian Open champion Petr Korda and Holt, the son of Tracy Austin, the 1979 and 1981 US Open champion are good friends, but their famous parents aren't a topic of conversation when they room together at USTA camps. "We don't sit down and talk about each other's parents," Holt said. "But a lot of people bring it up. Kind of joking, you guys are guaranteed to better than us at this, because your parents are professional athletes. But we don't really talk about that." Having the guidance of someone who has been through the stages of tennis and gotten to the top is not something that Holt takes lightly however. "There's a ton of crazy tennis parents, that don't know the process," Holt said. "Knowing you can trust your mom, on the whole entire process, because what she says is going to be pretty accurate, even if I don't always listen." Sam Riffice also advanced to the second round, beating Piotr Matuszewski of Poland 6-7(4), 6-2, 6-0. In addition to Mossmer, four other US girls won first round matches. Wild card Carson Branstine beat Dominique Schaefer of Peru 6-1, 6-4, No. 4 seed Amanda Anisimova breezed past Eva Guerrero Alvarez of Spain 6-1, 6-4 and No. 10 seed Claire Liu defeated Ylena In-Albon of Switzerland 6-1, 6-3. Seventeen-year-old Sonya Kenin, who reached the US Open girls final last year, is back again, and for the second year in a row, is playing the junior tournament after playing in the main draw. The winner of the USTA wild card challenge based on results in a three-tournament Pro Circuit swing, Kenin drew Cincinnati champion Karolina Pliskova of the Czech Republic, the No. 10 seed, in the first round and lost 6-4, 6-3. "I was playing well, hanging in there," Kenin said of her match with Pliskova, who plays Venus Williams for a place in the quarterfinals on Monday. "I had a few chances, in the first and second sets, and I was right there, so overall, I was happy." Kenin said her experience in 2015 helped her against Pliskova. "I knew what to expect, and I was on a better court this year," said the Floridian, who has not yet turned pro. "I was on Court 17, not 4 or 5, like last year. I knew what to expect, I knew the New York crowd would be behind, so I tried to play my best game." Kenin was back on Court 17 for her opening match in the juniors, and after seeing a 4-1 first set lead disappear, she recovered to beat Mai Hontama of Japan 7-5, 6-2. "It was obviously different playing her," Kenin said of playing a junior after facing one of the best servers in the women's game five days ago. "I know she's a good player, I'd heard about her, but her serve was much easier. Hitting-wise, obviously Pliskova's way bigger, and hits a little stronger." Kenin had a simple answer to the question of why she decided to play the juniors again this year. "I like playing and I like playing juniors," said Kenin. "It's my last year, so hopefully I can take the title." Only two seeds lost on Sunday, with No. 9 seed Benjamin Sigouin of Canada going out to Louis Tessa of France 1-6, 7-6(2), 6-3 and No. 14 seed Kaja Juvan of Slovenia losing to Xiyu Wang of China 6-4, 6-1. On Labor Day, 22 more American juniors will take the courts for first round matches, with the schedule here. The girls singles draw is here. The boys singles draw is here. The doubles draws are out, with Ulises Blanch and Japan's Yosuke Watanuki topping the boys draw, and Anastasia Potapova and Olyesha Pervushina of Russia No. 1 seeds in the girls draw. In addition to the remaining first round of singles matches, four girls and four boys doubles matches are scheduled for Monday.